Sam Raimi is too busy being successful to direct. 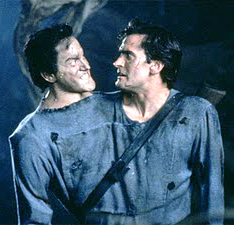 Bruce Campbell and his chin were too busy being successful to act. Big budget horror movies always play the PG-13 game to cater to a younger audience (because kids don’t seem to be able to sneak into R-rated films like they used to). Today’s CGI-heavy special effects won’t hold up against the high substance, low budget beauty of the original. The preview didn’t make me laugh once. Those are a lot of claims for a new movie to fight off, even if it did have a shot-gun and chainsaw. But I had an argument with myself, because that’s what maladjusted critics do when they know they’re doing something wrong. The discussion went on for quite some time. Finally, it was decided that we…I mean, I…would get the new Evil Dead on Blu-ray when it came out to see if my fears held strong. When I first popped Evil Dead in, I had my pen and notebook handy so that I could list every minute detail of the movie that I had a problem with. That’s what I do as a critic with an assumption: make sure I can prove that my assumption is right with as many facts as possible. The movie crucifixion started off great. Apparently, hillbillies have a knack for reading ancient Sumerian texts like the Book of the Dead. They can also light a body tied to a wooden stake on fire without burning down their whole house. FAIL. The bridge that was extraordinarily ripped apart by unknown forces in the original movie was replaced by a creek. Obviously, the creek is going to flood so that a Jeep and Ford station wagon can’t cross it. FAIL. Oh look, there’s the car Ash drove in the original, all rusted out from sitting there for decades. Didn’t it get sucked into the portal that dumped it with Ash into Medieval Times? How did it get back here? Nice shirt, David. It was just as nice in the woods back in 1981. Haven’t I seen that necklace somewhere before? Are these homages to the original movies, or cheap gimmicks to tide over the wrath of the original’s fans? FAIL. FAIL. FAIL. Upon the reading the words, the pen dropped from my hand. A hard breeze pushed the branches of an old tree next to my house against my window over and over again. The sky became cloudy, the moon red. A droplet of drool trickled down my chin. It was all over. I began to enjoy the movie. 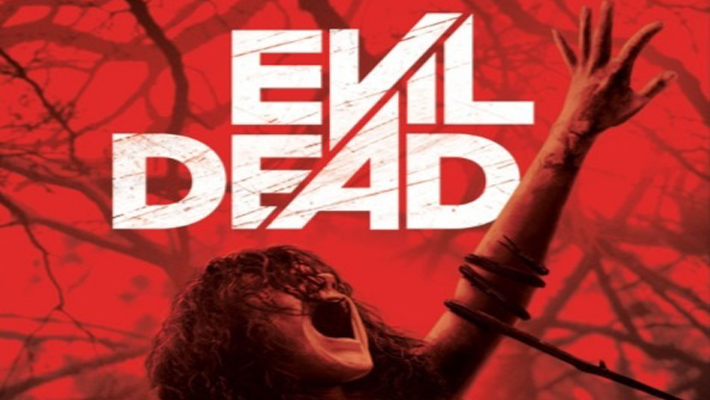 The new Evil Dead is not the next stage in ridiculousness for the Evil Dead franchise. Instead, it should be viewed as the evolution, or even the sequel, of the first film, The Evil Dead from 1981. That film may have been low budget, but it had the same, creepy feeling of a possession movie like The Exorcist, just with more demons, more action, and more gore. Sounds like the perfect movie to me. If you watch this new version after watching the original 1981 release, all of those FAILS that I listed above are eradicated. Well, except for the necklace, but let’s not get hung up on minor details. At the end of the first film, the bridge is destroyed, so having a river-bed in its place makes perfect sense. Since we don’t know what happened to Ash, his car could very well have been left to rust for all these years. Confused by the dark forces haunting the woods? Well prepare to be schooled in the ways of the Book of the Dead. Instead of random deadites eating peoples’ souls and taking over their bodies, we are given a back-story on demonic possession, and the ritual that our poor, ignorant teenagers have unwittingly become a part of. Some may see this explanation as annoying and spoon-fed. I would have thought so, too, but I have expunged my critical ramblings in order to LOVE THIS MOVIE. The explanation gives this rendition of Evil Dead more purpose than being just another remake. It also opens up our deadites to act like Regan MacNeil from The Exorcist, complete with wonderfully disturbing sexual innuendo that only a demon from hell can bring us. As far as special effects, the new Evil Dead used CGI minimally, for enhancement rather than full effects. Sure, you can have someone cut their face off, split their tongue in two, lop their own arm off, or shoot themselves in the face with a nail-gun using only prostheses and a couple buckets of corn syrup and red food coloring, but why not enhance it with some digital work? Even the acting was well done. Mia (played by Jane Levy) stole the show with a performance that would make any deadite proud. David (played by Shiloh Fernandez) does an amazing depiction of a loving brother conflicted with how he can best help his sister. The rest of the cast play their parts well. That may sound simple but, with some of the over-the-top or totally bland performances that have been mailed in with horror, it speaks volumes. 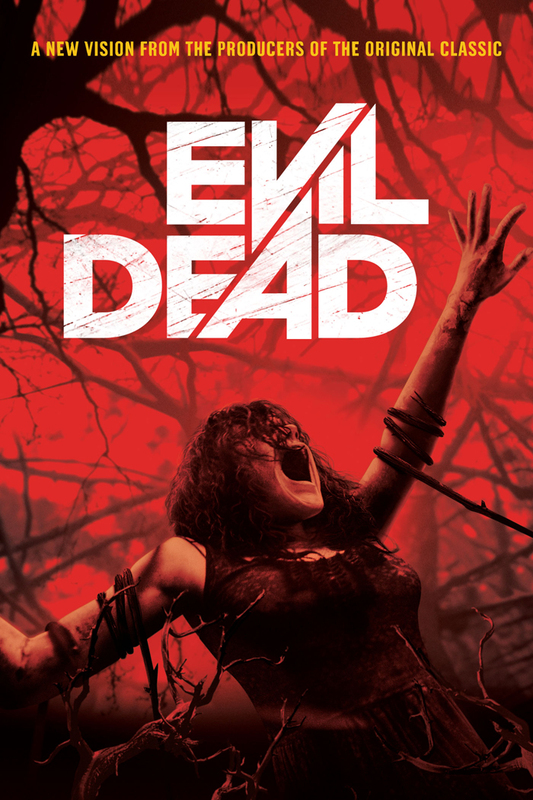 I give this new Evil Dead movie 4 out of 5 deadites, proving that I can change my mind no matter how hard I fight against it.